The Chan Zuckerberg Initiative will be announcing a “moonshot” for education sometime soon, said Jim Shelton, president of education for the organization, during his closing keynote remarks at SXSWedu here last week. Shelton mentioned the moonshot twice during his speech, hinting at what promises to be a dramatic, far-reaching goal in education—but only touching on what the effort to attain it will look like. To get to that goal, it will take “innovation clusters” for collaborations to advance learning, he said. What Shelton did address more directly are CZI’s plans to focus on learning science and learning engineering, starting with work around better measurement of student progress and what interventions make the most difference. “The only way we’re going to get better answers is to have better measures,” he said. “Social-emotional learning” has emerged as a critical issue in many K-12 systems today. But what do schools want from providers of curriculum, PD, assessment, and other products and services? On March 22 at 2 p.m. eastern, EdWeek Market Brief will host a webinar to take a look at school districts’ biggest demands for SEL, and what it means for providers. Sign up here to join the conversation. That will require linking researchers, developers, and entrepreneurs—”the people you need to perform experiments, create products, iterate quickly, and scale the things that actually work,” he said. One such collaboration was also announced last week: a $30 million grant from CZI for Reach Every Reader, a five-year literacy program that combines the expertise from both the Harvard Graduate School of Education and Massachusetts Institute of Technology’s Integrated Learning Initiative. According to an announcement from Harvard, the two institutions will combine their expertise in cognitive science, reading, learning technologies, and evaluation. Their goal is to help all children thrive and succeed as readers. Additional collaborators and researchers from the Florida Center for Reading Research and College of Communication and Information at Florida State University, and the Charlotte-Mecklenburg School District in North Carolina will be involved in the program..
CZI itself was launched by Facebook CEO and founder Mark Zuckerberg and his wife Priscilla Chan in December 2015. The initiative focuses on education, science, and advancing justice and opportunity. Summit Public Schools is the organization’s first educational partner, and Summit Learning, an online personalized-learning platform, is currently being marketed to schools across the country. When the couple announced CZI, they said their plan is to eventually donate 99 percent of their Facebook shares—worth an estimated $45 billion—to causes they support. CZI was formed as a limited liability company, which means it can make direct investments in for-profit companies, engage in lobbying and make political donations, as well as philanthropic investments. In February, Zuckerberg sold nearly $500 million worth of Facebook stock to fund the philanthropic efforts, according to Business Insider. In his SXSWedu remarks, Shelton suggested crowdsourcing solutions as a way to make changes that are effective—and equitable—for education: “On these hard problems, how do we tap the genius of the world in more effective ways?” he asked. “It’s work we’ve talked about a lot. Listen to people’s voices—those living and doing [the work.] Then learn fast, and learn by doing, because people can’t wait. That’s the world we’re living in; that’s the work we’re trying to do,” he said. 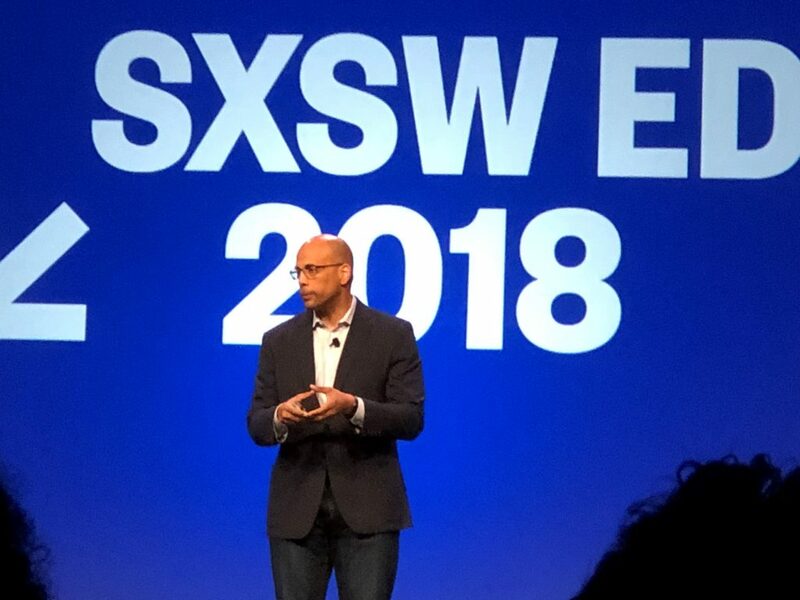 Photo: Jim Shelton delivers one of the closing keynote speeches at SXSWedu in 2018, by Michele Molnar of EdWeek Market Brief.